Oracle provides organizations a complete HCM cloud solution that drives digital transformation and improves business agility while meeting both current and future business requirements. Our vision for organizational excellence is driven by talent analytics. Discover how you can give your people the power of data in this report, HR Moves Boldly into Advanced Analytics. Discover how HR is using analytics to optimize the workforce. Why Oracle HCM Cloud for Your Business? It’s a new world for employees and human resources (HR) professionals. Expectations are changing inside and outside the office, and the pace of change is accelerating. In less than 10 years, social media and mobile technologies have transformed both our personal and our professional lives. Artificial intelligence (AI) and machine learning are found in more of the tools we use daily, and who knows what tomorrow will bring? Managing a workforce in the midst of digital transformation requires a human capital management (HCM) solution that’s not only smart but agile. And because engaging employees is a higher priority than ever, it must be intuitive and simple. Fortunately, there is a solution. HR leaders want their HCM solution to support changing business requirements around talent management and talent acquisition while furthering workforce productivity. To make the employee experience familiar and engaging, they want to leverage AI and machine learning to simplify routine processes and transactions, and align their people strategy with their business. Oracle Human Capital Management Cloud (Oracle HCM Cloud) enables HR leaders to deliver end-to-end functionality that complements all facets of the employee lifecycle, providing a boost to the organization and its performance. In fact, that’s one of the reasons why a leading analyst positioned Oracle HCM Cloud as a visionary leader. Obsolete tools are a barrier to employee engagement. A modern HCM cloud solution offering a personal and intuitive employee experience has many built-in advantages over outdated legacy systems. HR leaders know that when they provide self-activating transactions that require fewer inputs from their users, they get higher completion rates and measurable time and cost savings. And a familiar, newsfeed-style homepage and a smarter HR help desk increase usage. With Oracle HCM Cloud, users can select their preferences on one device and know that those preferences will be automatically applied to all devices they control, eliminating setup and providing greater convenience. When simple interactions and the look and feel are consistent on each device, the result is a more personal and rewarding user experience. From recruitment to retention and every facet of talent management, emerging technologies such as AI and machine learning offer HR departments enormous potential. An HCM cloud solution built with an AI-first approach can help executives and individual contributors make faster and smarter decisions. AI embedded in applications can recommend roles and mentors, suggest coursework and additional learning opportunities, and even predict which employees might be thinking about leaving the company. AI matching helps recruiters identify best-fit candidates and assists employees to find their optimal career paths. These technologies support decision-making by drawing on the huge flows of information available within the enterprise. HR performance data joined to sales and marketing and other operational data offers executives valuable insights based on facts rather than assumptions. As the volume of data increases and insights come into sharper focus, Oracle HCM Cloud progresses from telling you what has happened in the past to what will happen in the future—giving organizations a compelling competitive advantage. Today’s workers value mobility and want to be able to interact with HR systems on any device, at any time. Many of them work remotely or travel often. They want a solution that allows them to access their information from anywhere and employ tools that propel their success. HR processes and interactions need to operate seamlessly with a mobile-centric experience. This means using high-performing pages that load content fast and include only the data and tasks that users need to engage with. Oracle HCM Cloud’s mobile-responsive design enables businesses to offer one experience across all devices and browsers by providing a consistent look and feel, functionality, personalization, performance, and data security. Seamless experiences boost user engagement and business performance while reducing device management costs and security challenges. Chatbots and conversational interfaces make interactions with HCM solutions simpler and more rewarding. Empowered by natural-language–processing capabilities, chatbots effectively support users all the way through to the final steps of each process, bringing a satisfying experience to recruiting, onboarding, training, career development, and more. Digital assistants and voice recognition software encourage even more engagement. Digital assistants and other conversational interface technology are advancing rapidly and will soon become the primary way in which users interact with software. Oracle HCM Cloud is designed to be easily configured to work with any conversational interface or assistant, bringing the power of this new world of work to HR. Can your developers access your system to perform custom configurations or special integrations? If the future of your business is tied to integrating your HR technology with other business applications, you owe it to yourself to learn more about Oracle HCM Cloud. Oracle HCM Cloud is built from the ground up to work as a single platform, while still giving you the ability to tailor the solution to suit your specific needs. It can integrate with your financials, customer experience, and supply chain management software to better align your HR department with business goals. Its platform-as-a-service (PaaS) extensibility for custom-built applications opens Oracle HCM Cloud to the full range of possibilities and allows HR leaders to adapt to an ever-changing world. The tools of the future will be simple, smart, and agile. Only Oracle HCM Cloud offers you these tools today. A complete, global HR solution to engage your workforce and optimize operations. Includes workforce modeling and HR help desk. Recruit, grow, and retain your employees with talent acquisition, learning, and performance management. Create a successful workforce rewards program with effective compensation, benefits, and payroll processes. Includes time and labor management, absence management, and expense management. Improve employee engagement with reputation management, wellness tracking, and skill and career development. Can you deliver actionable insights for better decision-making? Built with an AI-first approach, Oracle HCM Cloud helps you make faster and smarter decisions to drive business transformation. Our artificial intelligence (AI) recommends roles, suggests learning, and predicts which employees might be thinking of leaving the company..
How will you keep your employees engaged? Deliver superior employee engagement and innovative workplaces. Oracle HCM Cloud puts the people experience at the center of the design in a way that’s consistent, simple, and meaningful. How quickly can you adapt to legislative and organizational changes? Achieve workforce and business agility with a flexible solution that meets your changing business practices, needs, and requirements. Easily configure things like org charts and workforce modeling— without IT’s involvement. What Will Your Organization Be Tomorrow? Are your HR processes consistent across your organization? Delivering end-to-end business processes helps maximize outcomes because it’s easy to own, increases your ROI, and lowers TCO. 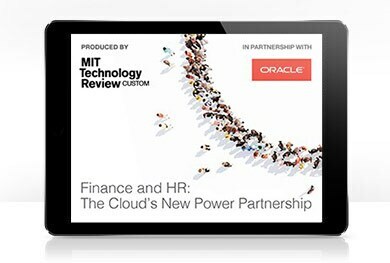 Oracle offers the most complete HCM cloud solution on one common platform with recruiting, core HR, talent management, payroll, time tracking, and work-life solutions. 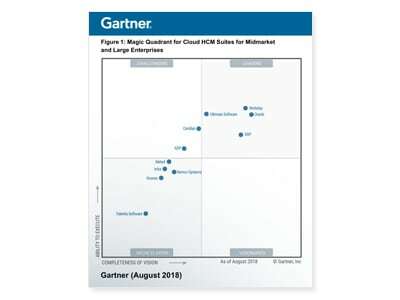 Oracle is a Leader in the 2018 Magic Quadrant for Cloud HCM Suites for MidMarket and Large Enterprises. Positioned furthest right in completeness of vision. Prepare your HR organization to stay agile. 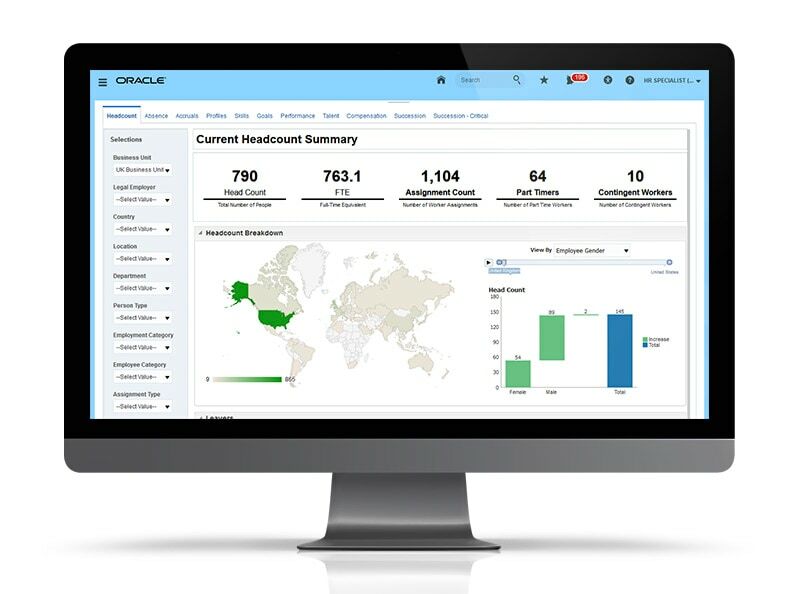 Experience a guided tour of Oracle HCM Cloud.